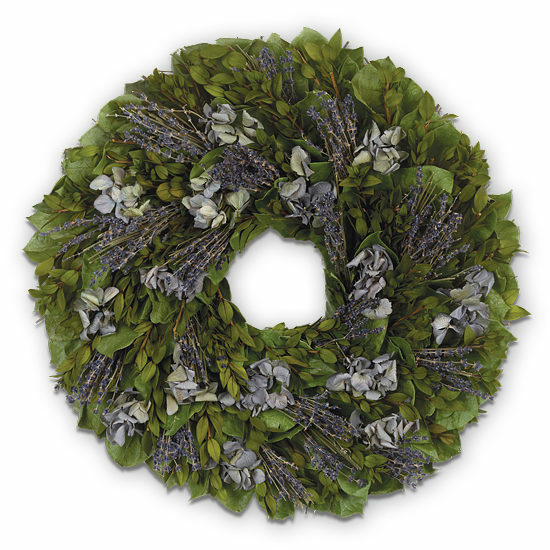 The epitome of quaint-chic, this welcoming preserved wreath is for the person who prefers everyday elegance. Handcrafted with a combination of naturally blue hydrangea and lightly fragrant lavender is woven on a bed of naturally dried leaves and green myrtle, all secured to a natural twig base. This large wreath is perfect for gracing family room fireplaces, rooms with high ceilings, perhaps even an office lobby. To remove, simply snip straps on the bottom of the box and lift the item gently. Our preserved designs are originally produced with extra elements so slight shedding during transit is normal. The colors will soften naturally over time. Designs are best maintained when displayed indoors, away from direct sunlight, strong heat sources and extreme moisture. Please note: outdoor display is not recommended.